When it comes to public relations, startups are often focused on what they can do to win coverage and secure that big story to help make a splash in a noisy space. So much energy is poured into landing the interview or getting that speaking gig, that it’s easy to under-index on the part that comes next: what you’re actually going to say. Terra Carmichael’s decades of experience in communications have shown her that from the smallest startups and greenest founders to the largest companies and most seasoned executives, most PR blunders are actually strikingly similar — and completely avoidable. Instead of chasing those glowing puff pieces or coveted cover stories, the current VP of Communications at Eventbrite argues that leaders should be putting more thought into what not to do. Because no matter what you're building, following Carmichael’s expert advice on finding and pitching the right journalists is only half the battle. You still need a game plan for navigating the interview itself. And from botched messages to those embarrassing yet unintentional gaffes, there are all too many ways for an interview to go off the rails. Luckily, after working with companies such as Yahoo, Mattel, Nike and Trulia, Carmichael has a good sense of what to look out for and avoid. 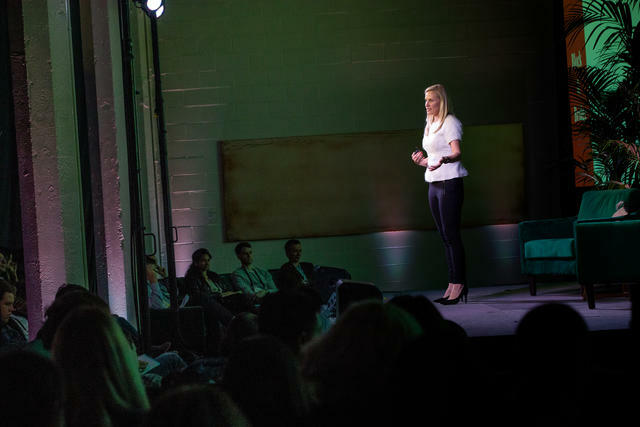 At First Round’s Founders Summit, she boiled it down to the four most common comms mistakes companies make, sharing her practical tips and techniques for sidestepping them. “Fake it till you make it” has long been a popular operating philosophy, especially among first-time founders or early startup teams finding their way to traction. But the truth has never been more important. And faking it publicly can have dire consequences. But faking it needn't rise to the level of criminality to become a problem. “There are loads of subtle and innocuous ways that people fake it and get carried away,” Carmichael observes. For help with that, there are a couple of exercises Carmichael recommends. One is just a simple audit. “Ask your team or trusted colleagues to give you real feedback on where you crush it, and where you fall down. You’d be surprised what people will share with you when you simply ask and give them permission to tell you when things aren’t working,” she says. When you’ve discovered your authentic self, it’s easy to feel ready for primetime and eager to share your message with the world. But as Carmichael cautions, there is a hidden danger here: Saying too much. According to Carmichael, there are many factors that lead people down the path of talking too much or speaking too transparently in interviews: sometimes it’s ego, the fear of being misunderstood, nerves or just wanting people to like you. Whatever the reason, it’s easy to slip up and slide into sharing too much. And it’s not always a matter of getting carried away or being too chatty, but rather sitting down for interviews that you shouldn’t be doing in the first place. Know your message, deliver it and then put a period on it. Define the rules of engagement: As any trained comms person knows, there are certain terms you can use to navigate the conversation with reporters to maximize the chances of getting what you want. For example, you can frame a conversation as “off the record,” which means you can can influence a story by providing context without having your fingerprints on the story, if that is the best course. There are other handshake agreements that you can use with reporters when you already have a relationship with them, such as giving information “on background” or “exclusively” that can help you both achieve your goals. The goal of an interview isn’t to answer questions. It’s to deliver your messages. Prepare for the tough ones. Of course, focusing on getting your points across doesn’t mean that you shouldn’t give any thought to what a reporter might ask. Do your homework by reading up on the journalist’s recent pieces to get a feel for his or her style. Start by making a list of the questions you fear most. That way you can head into any interview knowing the five worst things you could be asked and have at least an outline of how you’d tackle them. “These can include scrutinizing questions around your business model, competitive landscape, exit plans and timing. It’s also important to be real about any potentials skeletons that may be hiding in your closet, and prepare as if they are going to be revealed,” Carmichael advises. The same advice applies when you’re asked about a problem your company or industry is facing. Don’t reiterate the problem, but instead talk about a solution. As an example, Carmichael cites an interview where a Lenovo executive did a masterful job of of bridging as he’s faced with probing questions about their earnings on the air. When it comes to strategic communications, it’s very easy to get wrapped up in dealing with reporters or crafting your external message. But in Carmichael’s experience, another major mistake leaders and companies often make is that they forget that their most important audience is already inside their building. “I’ve long believed that internal comms is often overlooked,” says Carmichael. “Too many executives either don't make the time, or think about it as an afterthought or nice-to-have. But in my view, employees really should be your number one audience, especially as you scale. It’s absolutely critical that you communicate with them authentically and often." But workshopping PR messaging isn’t the main reason to communicate inside. The industry is peppered with studies and data around the importance of employee engagement, highlighting that perks and benefits don’t necessarily mean your employees are engaged or believe in your mission. Rather, a culture that is built on accountability, authenticity, clear goals and strong two-way communication is what goes a long way to keeping your team engaged. Just doing an all-hands or a town hall meeting once a month doesn't cut it anymore. Employees need to feel a deeper connection to you and the business. Whether you’re bringing in a comms leader or you’re a founder of a small startup that wants to go it alone, the bottom line is that if you’ve put in the time cultivating your media network and getting in front of reporters, you should invest even more effort in learning how to talk to them and how to get your message across. Success comes down to understanding that, while communications and press can drive a business forward, they really need to be managed well. Navigate these testy waters by grounding yourself in your authentic truth, being laser focused on your story and your message, and most of all, by prioritizing your internal team.